Clarksville, Tn –-Austin Peay State University men’s golf returns to the links Monday with a trip to Jonesboro, Arkansas for the 22nd Annual Arkansas State Bubba Barnette Intercollegiate, hosted by Arkansas State at RidgePointe Golf Club. The Govs join a trio of other Ohio Valley Conference Schools on the par-72, 6,137-yard track in Jonesboro, with Belmont, Eastern Illinois and UT Martin among the schools slated to compete. Host Arkansas State, along with Florida Atlantic, Missouri State, Omaha, Oral Roberts, Samford, Southeastern Louisiana, Southern Illinois and UT Arlington. Monday’s opening day of tournament play will feature 36 holes and an 8:00am shotgun start, with the Govs set to be paired with UT Martin and Samford; Tuesday will also be an 8:00am shotgun start for the final 18 holes. Two years ago, the Govs placed fifth in this tournament; with such a young group headed to competition this week, no member of that squad will be in action for Austin Peay this week. The sophomore trio of Alex Vegh, Austin Lancaster and Michael Busse are locked into the top-three spots this week—Vegh and Busse look to lock up their fourth consecutive top-10 individual finishes, with the Govs as a team looking for their fourth straight top-three finish as they prepare to assault the program-record nine straight top-three team finishes in 2012-13. Freshman Chase Korte, who maintains the team lead in stroke average at 73.08, will play as the No. 4 this week, while freshman Garrett Whitfield will rejoin the lineup after a good showing as an individual at last week’s Phoenix Invitational. Jay Fox, who was runner-up in that event, will play as the individual this week. 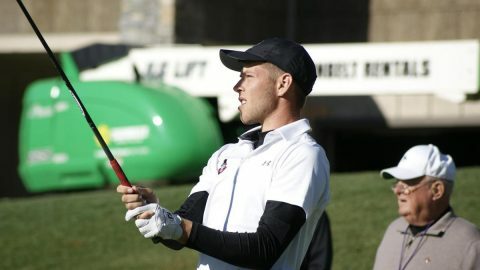 Live scoring should be available via GolfStat.com, while a complete recap will be available each day at LetsGoPeay.com.